At NJW, your Columbus, Ohio general contractors, we know the importance of maintaining a home’s integrity through design elements. 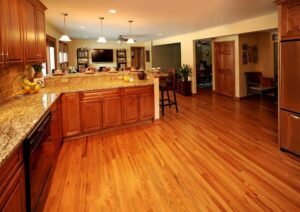 One of the most important elements that can give away a home’s secrets is flooring. The history of change in a house can often be read most easily in its floors. One with wide, hand-planed pine boards upstairs and machine-planed oak strip flooring down has been visited by remodelers, probably in the last few decades. A series of joints that form a line across the floor in the middle of a room for no appar­ent reason can indicate the shifting of a partition or the removal of a chimney. Unless your floors are both uniform and consistent with the style and vintage of your home, they probably can tell you something about the house. This is why it important to hire residential remodelers that are experienced in keeping the home consistent throughout, with NJW you will get just that! When you select flooring for new work, whether it’s to be an addition to the house or a remodeling of existing space, consider how the new surface will suit sur­viving older flooring. You might have to consider trying to find salvaged materials that will make the transition from the old to the new seamless, NJW can assist you in this whole process. Or maybe you wish to resurface a lot of the old flooring to match the new. Is there something in an original wood floor you can echo without copying its every detail—perhaps a border design, the board width, or the species and color of the wood? You may want to use an entirely different surface, like wall-to-wall carpeting in a new family room or tile in the new kitchen that coordinates with the old while not copying it, there are so many choices our there, contact NJW, your renovation and addition specialists to help you through the entire process. Since there are so many elements to consider it is best to find a professional with proven experience in having the new suit the old, flawlessly.